LANSING, Mich. -- Michigan State president Lou Anna Simon said her schedule wouldn't allow her to be at Larry Nassar's sentencing hearing Thursday, according to a woman assaulted by the serial sexual predator on the university's campus. 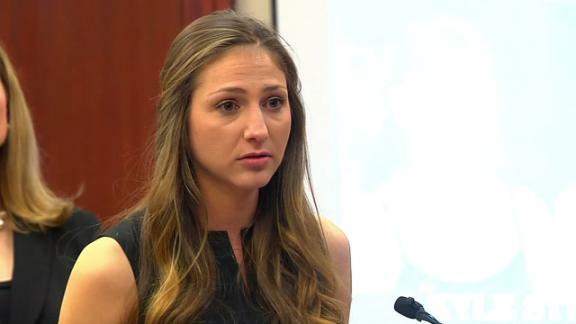 Larissa Boyce, a former youth gymnast who says she told the Spartans' gymnastics coach about Nassar sexually abusing her in 1997, was scheduled to be the final woman to provide an impact statement in Ingham County court Thursday afternoon. However, due to delays Thursday, she is now scheduled to speak Friday morning. Boyce said she approached Simon as she was leaving the courthouse Wednesday and asked her to attend the hearing. "I said, 'Will you come when I read my statement [Thursday]?'" Boyce recalled Thursday morning before learning her impact statement would be delayed until Friday. "She basically said she didn't think she could fit it in her schedule. ... She said, 'Well why don't we make a compromise? I'll watch the livestream.' I said OK."
A Michigan State spokesman declined to comment about Boyce's interaction with Simon, and there is no indication of whether Simon would attend Friday's hearing. Simon -- who was appointed president in January 2005 -- and the Michigan State University board of trustees have been widely criticized for their response to the scores of women who say Nassar, a former university doctor, assaulted them under the guise of medical treatment while on the school's campus. 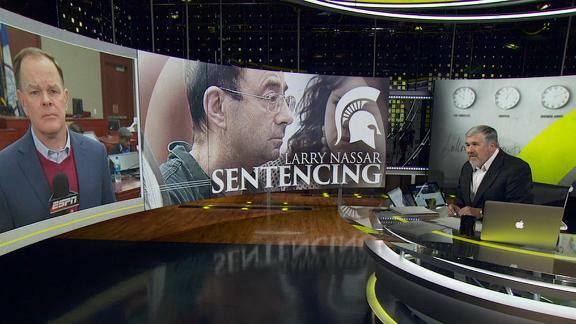 At least five women have said they told coaches, athletic trainers or other authority figures at Michigan State during the past two decades that Nassar was touching them inappropriately. Four high-ranking politicians in the state, including two Thursday afternoon, have called upon Simon to resign. On Thursday, the university's student newspaper published an editorial asking her to resign. Simon briefly attended the hearing Wednesday morning. She left within hours, telling reporters she was concerned that she was becoming a distraction. Simon said she originally planned to steer clear of the sentencing hearing -- expected to take at least a week -- so as not to distract from the women who were telling their stories in court. Several of the women have used their time to criticize the university's response to their cries for help. "I think there's steps being made towards accountability," Simon told reporters Wednesday. "There [are] other steps that will follow." Lindsey Lemke, a former captain of the Michigan State gymnastics team who says she was assaulted by Nassar, confronted Simon at the hearing Wednesday. 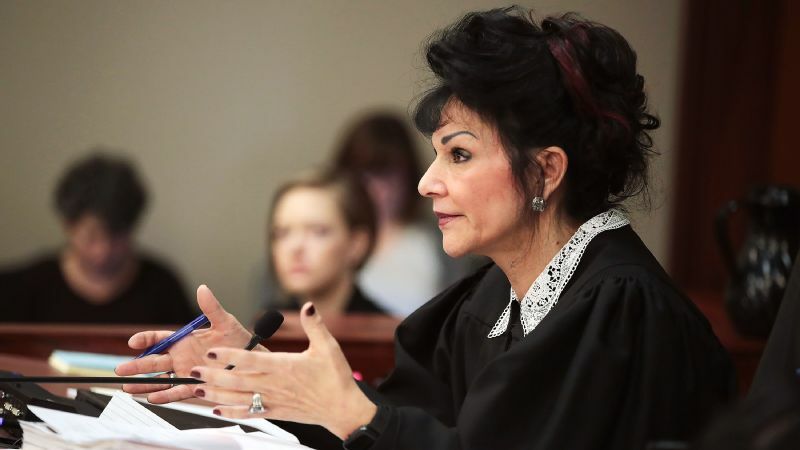 She spoke to the court Thursday and called Simon, among others who allegedly failed to stop Nassar during the last quarter century, "cowards." "You pissed off the wrong army of women," Lemke said. Nassar pleaded guilty to 10 counts of criminal sexual conduct in November. As part of that plea deal, he agreed to allow for victim impact statements during his sentencing hearing. The hearing began Tuesday morning, and more than 100 women are scheduled to speak in court before it ends. NCAA president Mark Emmert, speaking to media at the NCAA convention in Indianapolis, said he didn't know enough about the Michigan State situation to offer detailed comment. "I don't have enough information [on] the details of what transpired at the school right now," Emmert said. "That's obviously something that the university itself is looking deeply into. You hear that testimony -- it just breaks your heart when you look at it, but I can't offer an opinion at this time. 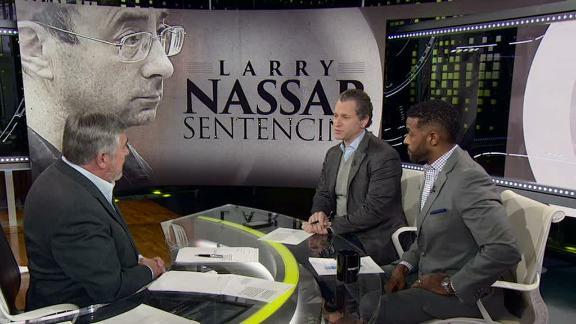 It's clearly very, very disturbing, and I know the leadership there is equally shaken by it." Information from ESPN's Mitch Sherman was used in this report.